Hastings College has a long and successful history of educating international students. With students from more than a dozen countries around the world on campus any given semester, you’ll find Hastings and the Midwestern community that surrounds the College a welcoming place to call home. We know it’s a difficult decision to move away from home to a different country for your college/university education. But we firmly believe experiencing a different culture is one of the best decisions you’ll ever make! At our friendly and safe community and campus in the central United States, you’ll find academic success and opportunities to experience a multitude of campus activities. In fact, we have more than 100 student groups and organizations — and all are here to help you meet new people, experience new things and build your leadership skills. Hastings College is Nebraska’s premier private college and one of the top private colleges in the region. With a student-faculty ratio of 14:1, our faculty will get to know you and have the opportunity to work with you one-on-one to help you succeed. At Hastings College you’ll become an expert in your major. Yet the value of a Hastings education goes beyond that. We offer the stepping stones of teaching, counseling, inspiring, supporting, guiding and advocating that start you on your way to your degree—and your path in life. With about 1,200 students and more than 60 majors, Hastings College is the perfect size to give you the individual attention you appreciate and the education you need to succeed in a career and in life. 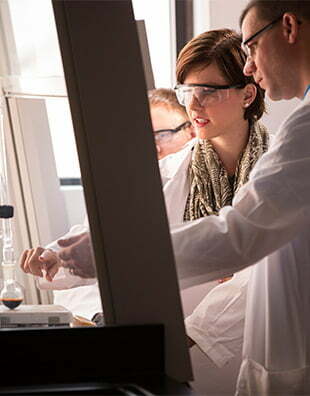 Our national-caliber professors simply love to teach! 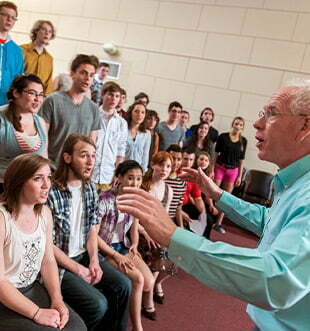 Hastings students are involved — in athletics, band, choir, art, theatre, clubs and student government. Our students volunteer in schools and churches, deliver food to those in need, clean parks, coach youth teams and serve as mentors. Want to see more? Check out this video ». Yet the value of a Hastings education goes beyond your major. Our one-on-one mentoring helps you build a path to graduate with a broad academic background. You’ll be mentally flexible, an excellent communicator, a creative thinker, able to manage and solve problems and answer the kinds of questions you can’t Google. These are the skills employers and graduate schools want! Check out our majors ». Admissions to Hastings College is based on your secondary grades, exam scores and essay. There is no application fee. The recommended deadline to apply is April 1 for fall start. This allows time for you to obtain a student visa, register for classes and sign up for campus housing. There are two ways to apply to Hastings College — and there is no application fee for either option. Create an account and apply on our website today ». Complete a Common Application (Common App) online and include Hastings College as one of the schools to receive your application. After applying to Hastings College, please send the items below to our our international admissions counselor Grant Hunter at ghunter@hastings.edu. Anguilla, Antigua and Barbuda, Australia, Bahamas, Barbados, Belize, Bermuda, Botswana, British Indian Ocean Territory, British Virgin Islands, Brunei, Canada, Cayman Island, Cyprus, Dominica, Falkland Islands, Fiji, Gambia, Ghana, Gibraltar, Grenada, Guyana, India, Ireland, Islas Malvinas (Falkland Islands), Jamaica, Kenya, Kiribati, Lesotho, Liberia, Malawi, Malta, Marshall Islands, Mauritius, Micronesia, Montserrat, Namibia, Nauru, New Zealand, Nigeria, Pakistan, Palau, Papua New Guinea, Philippines, Seychelles, Sierra Leone, Singapore, Solomon Island, South Africa, Sri Lanka, St. Kitts and Nevis, St. Lucia, St. Vincent and the Grenadines, Swaziland, Tanzania, Tonga, Trinidad and Tobago, Turks and Caicos Island, Tuvalu, Uganda, United Kingdom, Vanuatu, Vatican City, Virgin Islands, Western Samoa, Zambia and Zimbabwe. We are dedicated to making our education affordable for any student who wants to attend Hastings College. We even have a special grant just for international students! Because international students are valuable contributors to the Hastings College community, once admitted you’ll automatically be eligible for a $14,000 (US) International Student Grant. This is renewable for up to four years (for a total value of $56,000) and covers a significant portion of tuition. Learn more about these opportunities here. Once you’re admitted to Hastings College, we’ll email you a Hastings College Financial Aid Award Letter and your Financial Affidavit. Your Financial Affidavit will provide your cost of attendance minus any scholarships or grants you have been awarded. You must provide documentation to prove funds are available for at least one full academic year. Your original, signed Financial Affidavit and supporting documentation must be mailed and received by Hastings College before your I-20 will be processed. 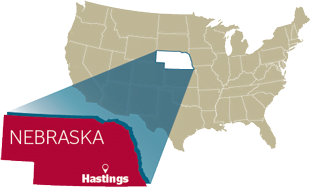 Hastings College is in Hastings, Nebraska, USA. Hastings a great college town and place to call home while you are at Hastings College. Rising from the south-central Nebraska prairie, you’ll find Hastings to be a progressive community of 25,000 people that takes pride in where it’s been — and is excited about where it’s going. Hastings is about 2.5 hours west of Omaha, Nebraska; 6 hours east of Denver, Colorado; and 5 hours northwest of Kansas City, Missouri (see our maps page for more). Hastings is considered a rural community and is surrounding by farmland where corn, soybeans and wheat are grown. There are also many cattle ranches nearby. It’s a beautiful place to live, with amazing sunsets and open spaces. Hastings is home to a top hospital, outstanding museum, movie theatre, many restaurants, places of entertainment and dozens of businesses, from manufacturing to professional services. Discover more about Hastings here ». You’ll experience four seasons of weather in Hastings—beautiful and colorful fall, snow and cool temperatures in winter, blooming flowers and sunshine in spring and humid and warm summer. Celsius). Fall temperatures gradually cool, with high temperatures being 78F/25C in September, 64F/18C in October and 49F/9C in November. Winter months sometimes feature snow (about 29 inches/74cm on average for the year), and cool temperatures. Average high temperatures are 37F/3C in December, 36F/2C in January and 40F/4C in February. Nighttime temperatures during the winter months can be as low as 14F/-10C. By spring, the days are longer and temperatures warm up. Green grass returns, flowers bloom and trees leaf out. Average high temperatures are 51F/ in March, 63F/ in April and 73F/ in May. Through all the changing seasons, you’ll find places and spaces to be with friends while making the most of your time in Hastings. Congratulations on your acceptance to Hastings College! We can’t wait to see you on campus! The best days to arrive to Nebraska are August 13-16, 2018.
International student orientation at begins August 17. Once your ticket is booked, submit your arrival information in a form shared by your admissions counselor. Completing helps us organize transportation for you to Hastings. One accepted to Hastings College, it’s important to complete your visa application in a timely manner. An outline of the visa process is below – but know that your admissions counselor is here to help and provide guidance as needed. The SEVIS fee can be paid using a credit card and completing the online form I-901 accessed by the above website. This payment must be made BEFORE you go to your visa appointment. Do not delay this appointment. It may take several weeks to months to get an appointment. Delaying this may delay your arrival to the United States. If you have additional questions about your visa or immigration status, please contact Angie Pinkerman, the College’s SEVIS official, at apinkerman@hastings.edu or 402.461.7435.